Don’t you just love it when you reach into the mailbox and find a piece of mail that isn’t junk or a bill? My dad sends us the kindest, most unexpected little notes. Two or three sentences just to say he’s thinking about us. It’s the best. A good old fashioned letter is such a rare thing that you can’t help but feel special when you receive one. I decided to make a few notecards to keep on hand. Something simple that I could send out for any no reason at all. These watercolor notecards fit the bill. They’re so colorful and full of love that you’ll want to send them out just because! 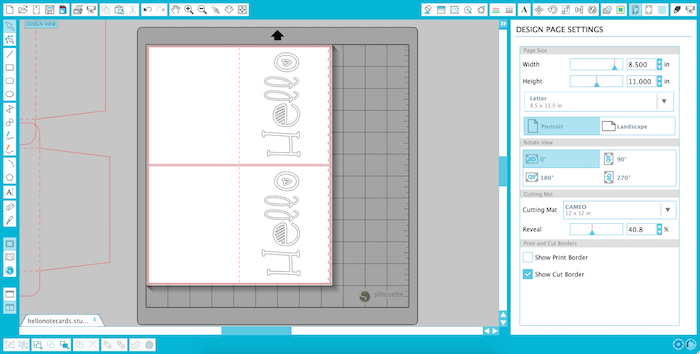 First you’ll want to open up a card design in Silhouette Studio. I like using this scalloped card and envelope set. 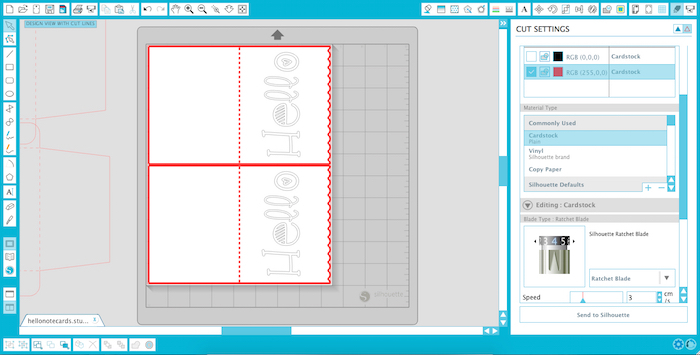 Duplicate the design and resize it until you’re able to fit two cards on one page. Move the envelope designs off to the side so they don’t get in the way. Look at the left side of your screen and select the box with the letter A in it. When you hoover over it, it should say “text”. 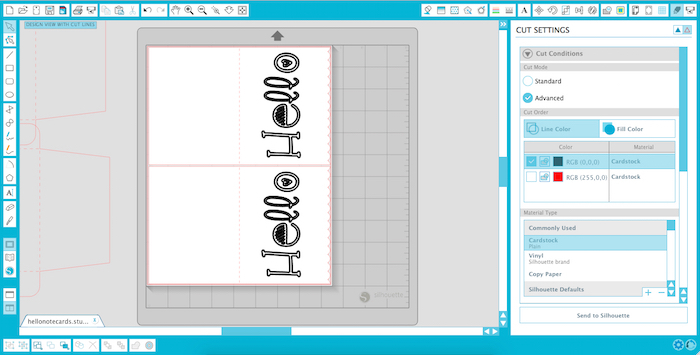 Click on your workspace and type the word hello. The text style window will open on the right. 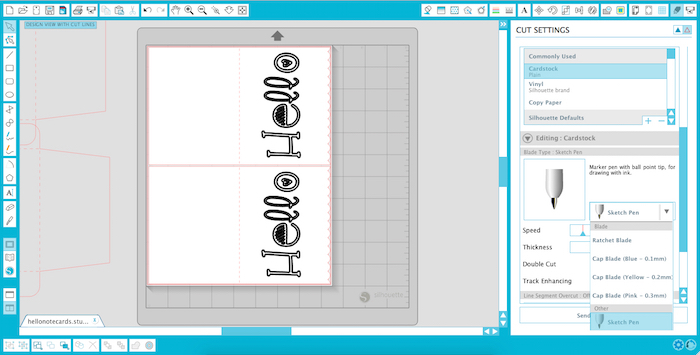 Click on the hello you just typed and then select the font style you want to use. This is my first time using the font mumbo jumbo and I’m in love with how quirky it is! 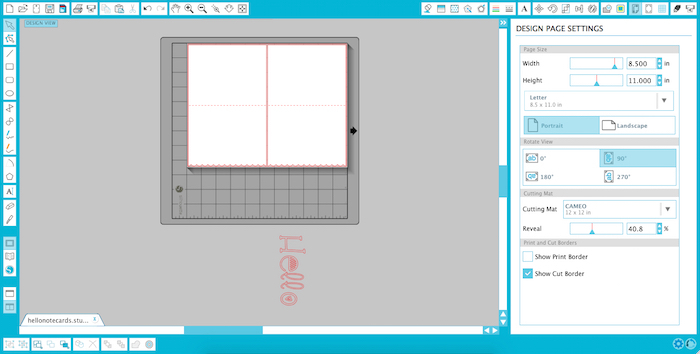 Open the design page settings window and rotate the view to 90°. This will make it easier to center your text in a minute. Click back on your text. Change the line color to black so it’ll be easier to work with when you’re ready to sketch. Now click on that green circle and rotate your text until it lines up with the notecards. Move the text to the notecard. Resize it and center it where it goes. Right click on the text and select duplicate. Move that duplicated text to the second notecard. Open the design page settings window again and rotate your view back to 0°. Now you’re ready to sketch and cut! First you’ll want to sketch the text. Begin by opening the cut settings window and selecting “advanced” under cut mode. Check the black box only which should just be the two hellos. 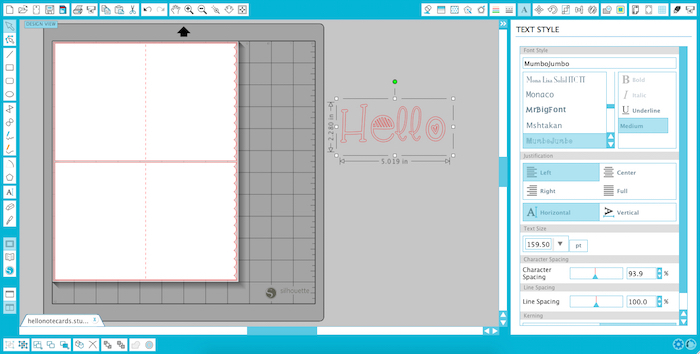 Select cardstock as your material type. 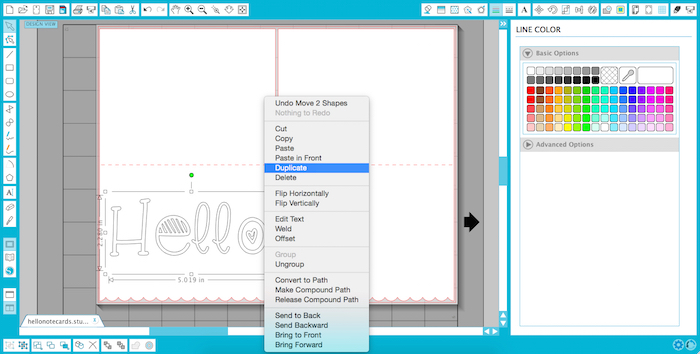 Scroll down until you see the drop down menu for the blade type and select “sketch pen”. Place the Silhouette sketch pen in the blade holder of your Silhouette. 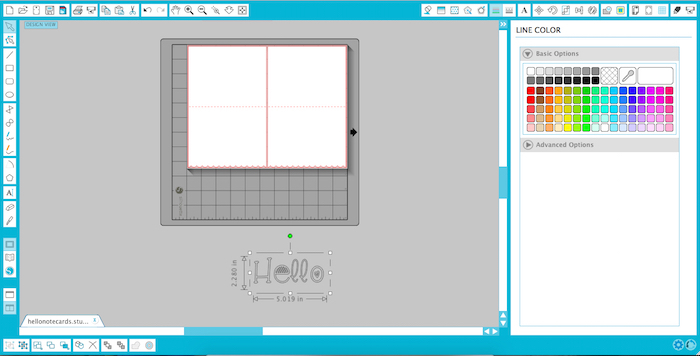 Send the project to your Silhouette and watch it sketch away! 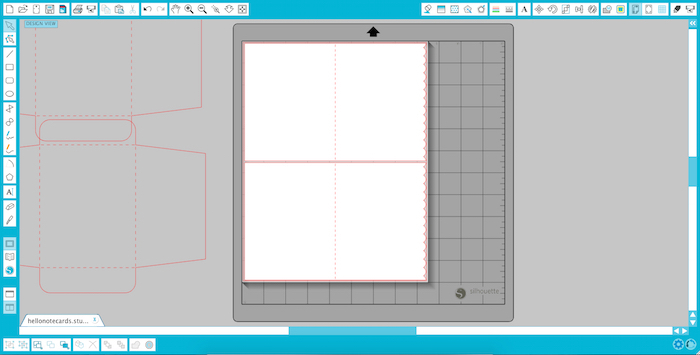 When sketching is complete do not remove your cutting mat from your machine. Just remove the sketch pen and replace it with the blade. Go back to your cut settings window and this time you’re only going to select the red lines which should be the notecard cutting lines. Change the blade type from sketch pen back to ratchet blade. Go ahead and cut the notecards out. Now that the notecards are cut you can get to the fun part…painting! I didn’t have watercolors on hand so I improvised by grabbing some paint from my son’s art supplies and watering it down a bit. Sometimes you just have to make do with what you have. I’m happy to say it only took a second and it worked out great! Now just go in with your brush and paint however you like. I didn’t have any problems with the sketch pen bleeding, but if you decide to use your own pen with the pen holder you might want to test it out first. To get the paint splatter look I simply tapped my brush over the notecards. This look happened by accident and then I kinda went with it. My artistic abilities are unbelievable right?! Hah! Lay your cards out to dry and you’re all done. Everyone’s day could be made brighter with a little snail mail. Now that your colorful cards are ready you have no excuses. Grab a pen and send a little happy to someone you love!